This Ultralite Explorer Hammock is a foot longer than the Expedition and is designed for anyone weighing up to 300 lbs /136kg and up to 7ft tall. It has the same durable materials, proportions and protection as the smaller Expedition. The hammock itself weighs only 1200g and is perfect for those wishing to cut down on heavier bulky sleeping systems. The complete package comes with a diamond shape basha to cover the hammock, the hammock itself is all enclosed with a mosquito net, and can be suspended just using the fixed ropes supplied directly to a tree or with the tree guards (supplied) to ensure no damage is done to the tree. The hammock is designed so that you enter it from underneath in a sitting position, lift your legs when inside and the fastening closes behind you leaving you completely insect bite free! 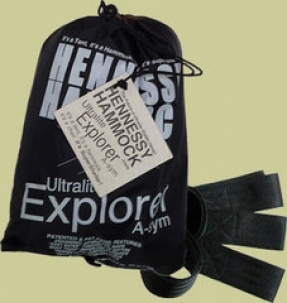 This hammock comes with either zip or velcro closures.